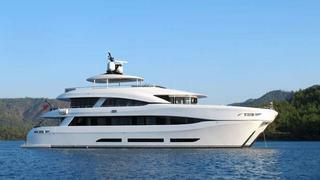 Delivered this spring, pictures of the catamaran superyacht Quaranta have been released. The photos showcase the distinctive styling of this four-deck, nine-metre-beam superyacht, delivered by Curvelle Luxury Power Catamarans in close cooperation with Turkey's Logos Marine shipyard as principal build contractor. Curvelle's 33.7m flagship yacht is the largest carbon hybrid composite power catamaran. She is said to provide 50 per cent more guest accommodations than a comporable 30m monohull thanks to her catamaran configuration and roomy beam. She has a flexible interior accommodation layout that allows stateroom configurations to easily be changed from six double or twin cabins to three spacious VIP staterooms. There is ample deck space on the mid and upper deck, and the upper deck dining saloon opens to the outdoors with its folding glass doors. The main deck features Quaranta's tender launch/lifting platform and beach club, which lowers the tenders and guests alike from the main deck level down to the water.